On the first Tuesday every month, the Delta Dental of Colorado Tooth Fairy visits the Children’s Museum of Denver at Marisco campus. It’s Target Tuesday and from 4-8 p.m., families can get in for free. The Tooth Fairy is there to talk to kids and families about good oral health. She gives them toothbrushes to take home and tips for how to take care of teeth. The museum is a great partner. They serve more than half a million visitors a year so they help us reach communities in a familiar space. On Target Tuesdays, 50% of attendees are under age 10. This is important because 40% of kindergarten children and 55% of third-grade children in Colorado have cavities. Since cavities are almost 100% preventable, we work to help kids and their grownups understand oral health. At the museum, kids can visit The Village of Healthy Smiles and pretend to be a dentist working on a mouthy chimpanzee. They can practice brushing their teeth at a robotic steampunk station and learn about foods that stick to teeth and cause more cavities. When they’re done, they can head upstairs to The Teaching Kitchen. Every second Sunday of the month at noon, resident chefs blend donuts in The Teaching Kitchen to show kids how much sugar is in juice. 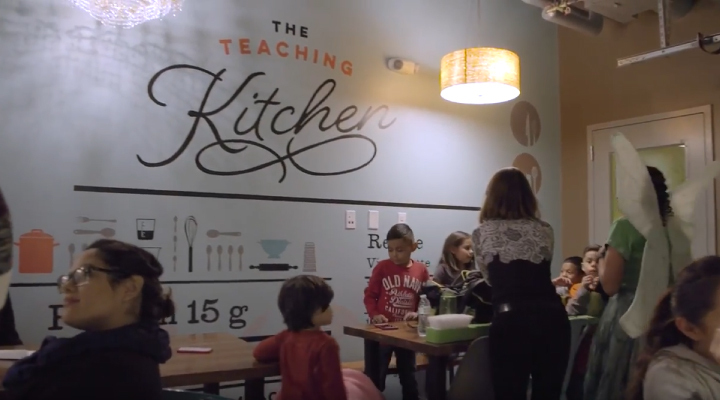 Since adults must be with the kids in the kitchen, they learn a lot too. Everyone hears about the importance of drinking water. The chef even offers fruit-infused options to guests to show that drinking water can be healthy and fun! With partners like the museum, learning about oral health is fun. Delta Dental of Colorado and the Delta Dental of Colorado Foundation support various education programs, and we’re always looking for new ways to educate children. Let us know how we can help support a program in your community. Email us at the Delta Dental of Colorado Foundation.